Please note: you are viewing this with a browswer that does not support frames, and you will not be able to see much of the web site's contents. Please try to visit with a browser that supports frames! Feel free to contact me with any questions. I will be happy to send you information via surface mail! LASIK is a procedure that can dramatically decrease your dependency on glasses or contact lenses for many of your daily activities. Approximately 98% of patients see well enough to drive without glasses or contact lenses, and about 66% see 20/20. LASIK is an acronym for laser in-situ keratomileusis. In this procedure, a computer controlled cool laser gently and precisely changes the shape of the cornea -- the clear part of the eye. It is as if the shape of a contact lens is permanently placed on the eye. The success of LASIK depends mainly on your eyes. LASIK may be right for you if your vision is stable and your refractive error is in the treatable range. There should be no other significant active eye problems. Your cornea must be thick enough to allow for the LASIK manipulations. You must have no significant corneal diseases. You must not be a "keloid former". You must have realistic expectations of LASIK and the possible complications. Briefly, LASIK works well for most people. But, for the best results, you may need a second LASIK procedure (an "enhancement"). * Know that there is no guarantee that you'll have "perfect" vision or never need distance or reading glasses again. In fact, most patients are able to improve their vision, perhaps very slightly, with glasses, after the procedure. * Laser vision correction does not correct presbyopia (the need for reading glasses) when one is 45 years of age. * It takes just several days to weeks for your eyes to heal and your vision to clear. * Generally, there is only minimal discomfort during and after the procedure. * Farsightedness changing to nearsightedness, or nearsightedness changing to farsightedness, or new or increased astigmatism, especially during the first few weeks to months after the procedure. * Corneal haze during the first few days or weeks after the procedure (rare). Vision may remain cloudy for a month or more (very rare). * Blurry vision, even with glasses (very rare). * Infection, which could scar the cornea and decrease vision (very rare). 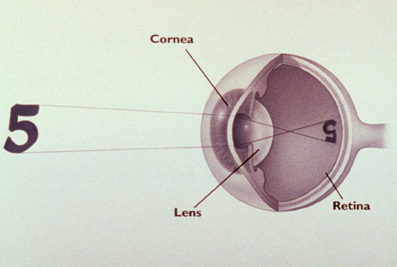 The cornea is the clear "window" of the eye. It takes the light that enters your eye, and helps focus it on the retina, where it is converted to signals your brain understands. 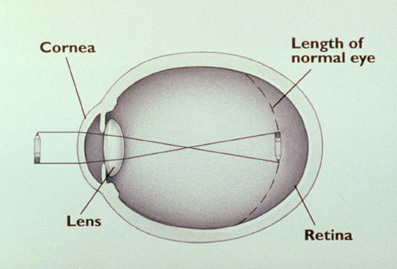 Problems with the shape of the cornea can keep you from seeing clearly. During LASIK, special instruments reshape the cornea so your vision is closer to normal. In myopia, the curve of the cornea is too steep, relative to the length of the eye. Incoming light from distant objects is bent so much it comes into focus in front of the retina, making your vision blurry. In hyperopia, the cornea is too flat, relative to the length of the eye. Light is not bent enough, and does not come into focus on the retina at all. Light from near objects creates an even blurrier image than light from distant objects. 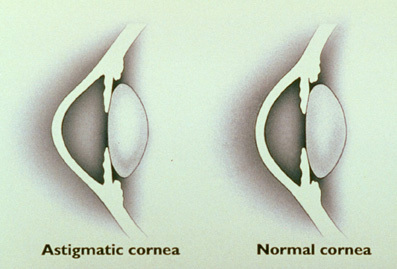 In astigmatism, the cornea is oval-shaped, instead of round. This results in complex distortions of all objects. 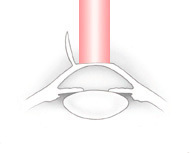 The two main instruments used during LASIK are the excimer laser and the microkeratome. The excimer laser produces a concentrated beam of ultraviolet light than is precisely focused on the cornea. The beam is so accurate, it can cut notches in a human hair. Because the excimer laser does not generate heat, surrounding tissue is rarely damaged. The microkeratome is a precision instrument that makes a thin, extremely precise, "flap" on your cornea, under which the laser does its work. Consider your cornea as a book, with 550 pages. I use the microkeratome to open the book to, typically, page 160. Once "inside" the book, the excimer laser is programmed to remove the number of pages corresponding to your refractive error. Of course, the cornea must be thick enough so there are still enough "pages" left over (typically 250). I then replace the flap on the cornea, and as it slightly dehydrates, pressure develops and holds it in place. Stitches are thus not used. 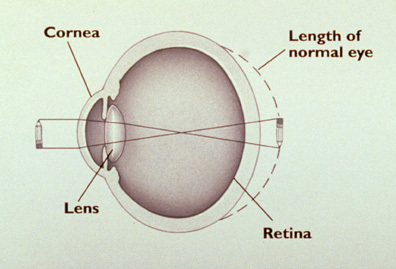 As a result, the curvature of the cornea is changed, and light rays are better focused on the retina. Your vision improves. please note -- full motion video links may take a long time to load!! The LASIK procedure typically takes about 20 minutes, including preparation in the laser room. You are awake, but feel essentially no pain because of numbing drops. During the actual laser procedure, you lie flat on a table, with your eyelids painlessly held open with a lid speculum. I place a small suction device on the eye that helps steady the eyeball, and mates with the actual microkeratome. Patients generally report feeling some "pressure", and their vision "grays" for a few moments. The microkeratome works in several seconds. 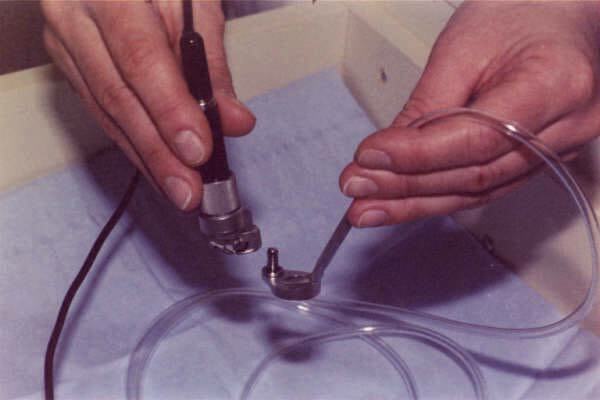 The suction is then removed, and I ask you to look at a red blinking fixation light in the laser instrument, as I gently lift the corneal flap. As I do this, the laser's fixation light appears fuzzy, but patients are able to look at it without problems. I monitor your fixation throughout the procedure and activate the laser. Over anywhere from a few seconds to under a minute, it performs the treatment. After the treatment ("ablation"), I gently replace the flap. At this point, your vision is typically significantly better than before, but it generally gets blurry over the next 24 hours, then improves. One eye is generally more blurry than the other, and one eye might feel slightly different than the other -- I am usually unable to predict which eye will do what. I will ask you to use lubricating and antibiotic-steroid drops after the procedure, and be very careful not to traumatize the eye for at least a week. A clear shield can be worn at night. You should have someone come with you for the LASIK procedure, since you probably won't see clearly enough to drive immediately afterwards. You may want to wear sunglasses if you go outdoors, as your eyes may be sensitive as they heal. You must use the eye drops as per my instructions, and must not bump or otherwise traumatize your healing eye. You should probably plan to take a day or two off from work. You probably should not swim, sit in a whirlpool or hot tub, play active sports, or wear eye makeup, for at least a week after the procedure. You must keep your follow-up appointments as per instructions I will give you. We offer a complimentary screening visit to see if you might be a candidate for laser vision correction. If you are, we then schedule more comprehensive, dilated, exam(s), the cost of which are deducted from your laser vision correction fee when you have the procedure. Laser vision correction costs $2750/eye. Some insurance benefits can lower your cost to as low as $1800/eye. Our comprehensive fee covers your pre-op evaluations, the refractive surgery itself, and any enhancement procedures that might be necessary, as well as your post-op care for up to one year. "Vision Fee Plan" provides monthly payment options specifically designed for refractive surgery, with payments that can be less than $100/month. They require no down payment, and the first payment is not due for 6 - 8 weeks. There is no pre-payment penalty. Click here for further information or to apply on line, or call toll-free 1-877-837-2272. You may pay by cash or check on the day of your procedure. Your company may offer a medical spending account, which allows you to use pre-tax dollars to pay for your medical expenses. Please contact your employer for further details. We participate with most insurance plans. Ask us! If your plan contributes to laser vision correction, and we do not participate, we still will honor their benefits. We recognize there are many "low priced" laser centers in the area, many spending fortunes on advertising. We do not advertise -- our patients do that for us! And we remind you that laser vision correction is surgery that requires meticulous care before, during, and after the procedure. You wouldn't have heart surgery based on a commercial or a discount -- do your eyes deserve any less? Talk with patients from the "discount/assembly-line LASIK" centers. Have they received personal attention from their surgeon, or do they feel like a number? You'll find many of them meet their surgeon only minutes before the procedure, and see him for ten minutes or less. We think a surgeon should know his patient. Did they see their surgeon before and after surgery? Is the surgeon still available to them now? "LASIK is a process, not a procedure". Do you want someone who advertises? Why would they spend money on advertising if happy patients could do it for them? Do you want a surgeon who must do procedures to pay for his commercials? Does the discount fee cover enhancements, should they be needed? Many facilities charge extra for enhancements. Will the facility still exist years after your procedure? Some low priced centers have simply gone under. Does the facility take a conservative approach? You might judge a surgeon by the cases he does NOT do. Eye surgery is not a "make it up in volume" affair. I am confident you will enjoy improved vision without glasses or contact lenses after laser vision correction, and hope this short paper answers some of your initial questions. If you need further information before your next visit, please call any time: 301-279-2770. And feel free to send e-mail with any questions.